Special Containment Procedures: SCP-1942 and SCP-1942-1 are to be contained in situ until such time as a permanent means of containment is developed. The Foundation has acquired all public and private property within a 5 km radius of SCP-1942's primary nest and has razed all buildings, roads, and man-made structures within the area. A 1 km perimeter around the primary nest is to be treated with high potency insecticide, to be renewed as necessary. Any SCP-1942 samples found outside the insecticide-treated area are to be destroyed. Personnel entering the containment area are to keep any necessary equipment on their persons at all times and any persons or objects exiting the containment area are to be fully inspected for presence of stowaways. Any devices created by SCP-1942, with the exception of SCP-1942-1, are to be removed from containment area as soon as feasible for study and archival. Materials desired by SCP-1942 may be introduced into the containment area at O5 discretion. Description: SCP-1942 is a colony of western harvester ants (Pogonomyrmex occidentalis), which at any given time consists of approximately 85,000 workers and drones and an unknown number of queens. 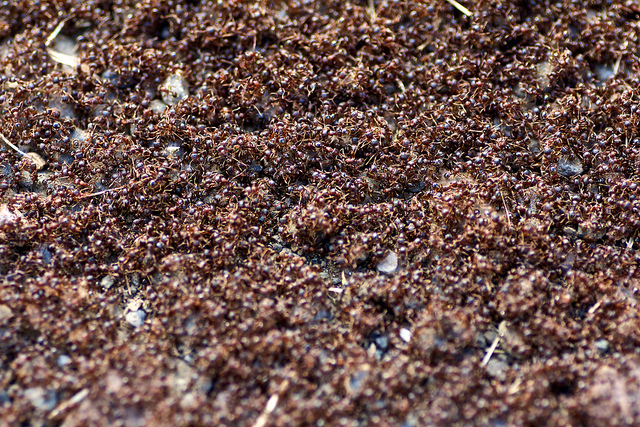 SCP-1942 inhabits a single primary nest and six secondary nests near [REDACTED]; to date, no other ant colonies within the [REDACTED] region have demonstrated properties similar to SCP-1942. Attempts to ascertain the depth of SCP-1942's nests, or the number of queens in the colony, have failed due to SCP-1942 acquiring and dismantling all monitoring equipment and miniaturized drones. The dietary and reproductive habits of SCP-1942 are typical of its species. Average lifespan of an SCP-1942 worker is approximately 55% longer than that of a typical P. occidentalis worker. The carrying capacity of SCP-1942 workers is well in excess of typical P. occidentalis capacity; a single worker has been observed to be able to lift and carry objects weighing up to 0.4 kg without injuring itself. Larger groups of SCP-1942 have demonstrated an ability to lift objects weighing several hundred kilograms. The mandibles of SCP-1942 workers are also significantly more powerful than is typical of their species; swarms of SCP-1942 working in unison have demonstrated an ability to cut through stainless steel with a precision impossible to humans without computer-operated tools. Large swarms of SCP-1942 have shown an ability to manipulate and use tools introduced into their environment. SCP-1942 possesses an ability to communicate via release of pheromones that is significantly more sophisticated than is typical of the species; analysis of SCP-1942 pheromones has indicated the presence of ███████ distinct compounds. At all times since observation of SCP-1942 began, large groups of workers not involved in digging, foraging, or caring for the queens and/or larval ants have engaged in scavenging man-made devices and raw metals from its environment, which it has used to produce a number of complex machines. Devices constructed by SCP-1942 have included electric motors and generators, chemical batteries, forges for smelting and refining of metal (including several exotic alloys and ores commonly used in [REDACTED]), centrifuges, tools for extracting and refining plant matter into vegetable oil, replacement parts for SCP-1942-1, and devices for producing and recycling oxygen. Minor seismic vibrations within the containment area have lead to speculation that additional devices not known to the Foundation have been built and are in use within the primary nest. The largest device constructed by SCP-1942 to date, designated SCP-1942-1, is an electromechanical computer weighing approximately 9000 kg and measuring 2.9m x 0.9m x 10m. SCP-1942-1 is operated by, and partially relies upon for computation, large swarms of workers who are in constant movement through a series of tubes built into the device. Ants involved in the operation of SCP-1942-1 have been observed to work in "shifts", entering and leaving every 6-9 hours. SCP-1942-1 outputs data in the form of pheromones, apparently produced from the processed corpses of dead SCP-1942 individuals, dispensed from large tanks on one end. It is speculated that SCP-1942 uses SCP-1942-1 to compute data necessary for the construction of other devices. At the time containment began, SCP-1942-1 was entirely ant-powered; SCP-1942 has since added several wind turbines and an electric motor to partially automate its functions. SCP-1942 has demonstrated no hostility to the Foundation or to humans in general, and has made no attempt to prevent or retaliate against the removal of objects from its habitat. Objects removed are often quickly replaced by new devices identical to the object removed. SEND ALUMINUM, CARBON, GRAPHITE, DEUTERIUM, THORIUM-232, SODIUM-24. CONSIDERATION WILL BE GRANTED. BREEDER REACTOR MUST BE ONLINE BY 20██ IN ORDER TO COMPLETE PHASE VI ON SCHEDULE. LAUNCH WINDOW IS ██/██/20██, WILL NOT REOPEN UNTIL 2███. All subsequent attempts at two-way communication with SCP-1942 have been unsuccessful. It is not clear whether SCP-1942 possesses the sensory capability to hear human language or to read printed words, or whether it chooses not to respond. O5 approval of SCP-1942's request is pending.